The Ambassador Hotel is a 3-star rated residence with your comfort and security in mind. We strive for all of our guests to have stress-free stay and make checking in and checking out procedures quick and simple. Further information surrounding our Terms and Conditions, Safety Policies and answers to Frequently Asked Questions can be found below. Ground floor rooms are available at the Ambassador Hotel. Upon arrival please report to reception where one of our friendly staff will be happy to check you into your room and answer any questions you may have between 1:30pm and 10pm. At the time of booking or at check-in we will ask you for a credit card and pre-authorisation of the card to ensure that any cancellations, damages, telephone charges or no-smoking policy breaches may be paid for. Please note that the card which is pre-authorised may be used for multiple room charges if the booking was made under a single guest’s name. We do hope you’ll come and stay with us but if you need to cancel then you can do so any time up to 48-hours before your arrival date, at no cost. Please make sure you inform us of any full- or partial-stay cancellations (for example if you decide to stay just 2 nights but booked for 3) before 11am two days prior to the start of your booking. If we don’t receive notice of your cancellation within this timeframe then your credit or debit card will be charged for one nights’ stay per room booked under your name. Please note: NON-REFUNDABLE OFFERS must be paid for at the time of booking and no refund will be made should the booking be modified or cancelled. This policy overrides the above Cancellation Policy. Reservations booked direct will have priority check-in available from 12.30pm instead of 1.30pm and we request that you vacate your room by 11am on the day of your departure. If you fail to check out by this time then an additional night’s rate will be payable. If you’re struggling to check-out by 11am because of circumstances out with your control, please seek assistance from reception. If you know in advance that the above timings will not suit your requirements, please contact the hotel to explore other possible options which may be able to be arranged in advance of your arrival/departure. If you or any guest staying in a room booked under your name cause damage to hotel property or lose a hotel key then these charges must be paid for at the hotel reception before departure. We want all of our guests to have a relaxed and enjoyable stay at the Ambassador Hotel and with that in mind, we reserve the right to refuse entry to any guest who behaves in an inappropriate manner. This extends to a guest or guests being under the influence of drugs and/or alcohol, abusive behaviour towards hotel staff or other guests, aggression, or unacceptable dress. For the safety of all of those staying with us we may ask a guests behaving in this manner to leave the hotel if a disturbance is caused. Should we eject a guest on these grounds refunds will not be given. The Ambassador Hotel is not liable for the loss or damage of any guest property during their stay caused by the misconduct or negligence of a guest or an act of God. Please use in-room safes at your own risk and note that the establishment is not responsible or liable for any damage to guest vehicles whilst staying with us. For your safety and comfort we do not allow pets on the premises with the exception of guide dogs. Our official website is the only booking platform where best rates are guaranteed. Bookings can be made quickly and easily online, by telephone, fax or email. Should you find that your preferred dates are not available through our online system, please phone the hotel to access real-time availability. You can pay a deposit for your room should you wish to but it is not essential to secure a booking. We accept cash in sterling (GBP) and all major debit and credit cards. In order for all of our guests to be able to enjoy their surrounds we impose a strict no-smoking policy in all areas of the hotel (including to the use of e-cigarettes). Should a guest smoke in their room or self-catering apartment a £100 fine will be charged to their pre-authorised credit or debit card to cover the cost or cleaning and fumigating. We’re only 20-minutes’ walk from the city centre and 10 minutes’ walk to the heart of the vibrant West End. The Hydro, SECC and bars and restaurants of Finnieston are on our doorstep. Yes! We welcome little ones at our hotel – if you require a cot or high chair please just confirm this with reception prior to booking. We charge a nominal fee for cot hire (£9). There are stairs leading to our entrance and between certain rooms and reception, please check with us prior to booking to see which rooms are available which may meet your needs. There’s free Wifi throughout the hotel and complimentary PC use at reception so you can stay connected throughout your holiday. The latest check-in time available is 10pm. Check our Your Stay pages and Blog for local information, or pop down to reception where one of our staff will gladly make some recommendations. Please see our Your Stay Pages or Blog for more information, or speak to reception for further details. Should I bring the car? We have a free onsite carpark for our guests. In–room safes are provided for your use – please see our Terms and Conditions regarding our liability policy. How many stars does the Ambassador Hotel have? 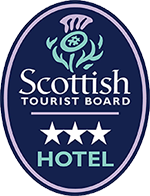 We were awarded 3 stars by the Scottish Tourist board and aim to provide all guests with excellent service and a relaxing stay. Our no-smoking policy strictly prohibits smoking (including the use of e-cigarettes) in all areas of the hotel. We do not except stag/hen parties or large groups. Should you wish to make a group booking of over 7 people please contact the hotel prior to making a booking.